Hesitated a little before deciding to do this post on the World Clown Association's annual meeting in Kuching, Sarawak, on the Malaysian part of the Island of Borneo. Received some comments from a Facebook post that made me aware some people have a phobia involving clowns. Not sure where this "fear" comes from. In any case, we happened onto the Association's weeklong meeting in town and attended their final public "show" at a local shopping mall in town. 150 or so clowns showed up and entertained the large crowd on hand. There was a "Paradeability" competition and other "on stage" performances. Clowns are entertainers and they never seem to tire of getting their pictures taken. There was a large contingent of Clowns from Asia, but probably from the fact that traveling to Kuching for the annual meeting was less of a challenge for them. I believe the organization's roots are in the United States, and there were plenty of clowns representing the U.S., but there were clowns from Puerto Rico, New Zealand, and other countries as well. Kuching is the Capital City of Sarawak, on the western portion of the Malaysian part of the Island of Borneo. It's also known as the Cat city (Kuching) and statues of cats are scattered around the main business district. There's also an extensive cat museum here. Kuching is a good city base to venture out in search of Orangutans, or Hornbills. A trip to the Orangutan Rehabilitation Center will give you a good chance of seeing Orangutans. Eating on the streets of Kuching. Eating small meals, as in many parts of Southeast Asia, is a way of life here. Covered, open air "hawker"type eating areas are all over the city. Several vendors selling a variety of items will share a common seating area, similar to food courts we have back home. 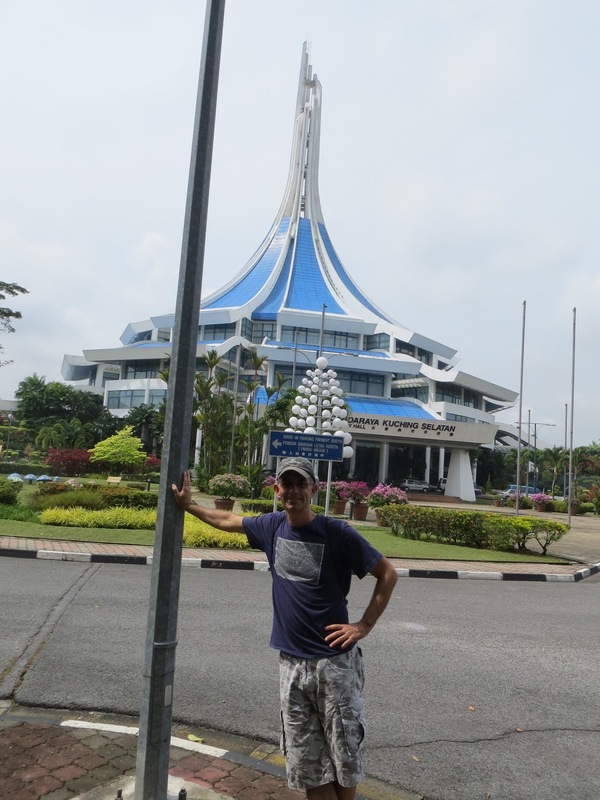 Alan in front of City Hall, Kuching. Kuching, like many of the large cities in Malaysia, have large Chinese communities. Chinese Temples are scattered throughout the city. One of the gateways leading into the main "Chinatown" area. The Sarawak River winds through the city. Alan in front of the Sarawak Assembly Hall.